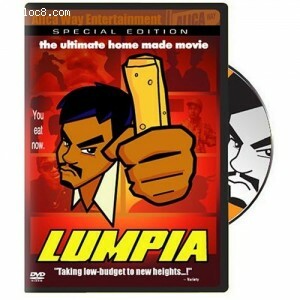 Synopsis: LUMPIA "the ultimate home made movie" finally comes home in a special edition DVD packed with never before seen features and music videos exclusively created for this home edition. LUMPIA takes you back to the late-90's when tension is at an all-time high in Fogtown High School. James (Francis Custodio) and his misfit pack of friends do their best to stand up to Tyrone (Edward Baon) and his crew of thugs who have invented a new fad of (gulp!) F.O.B. bashing! But only one hero stands in their way... a silent avenger (Carlos Baon) who delivers justice one deep-fried LUMPIA at a time! With James falling for his classmate Kelly (Elizabeth Mendoza), will such a fighter be enough to ward off the one enemy that threatens to obliterate all? Directed By: Patricio Ginelsa Jr.
Deletes Scenes not seen anywhere! Old short film: The Green Magician"
The LUMPIA Experience: Hear the movie with a sold out audience!